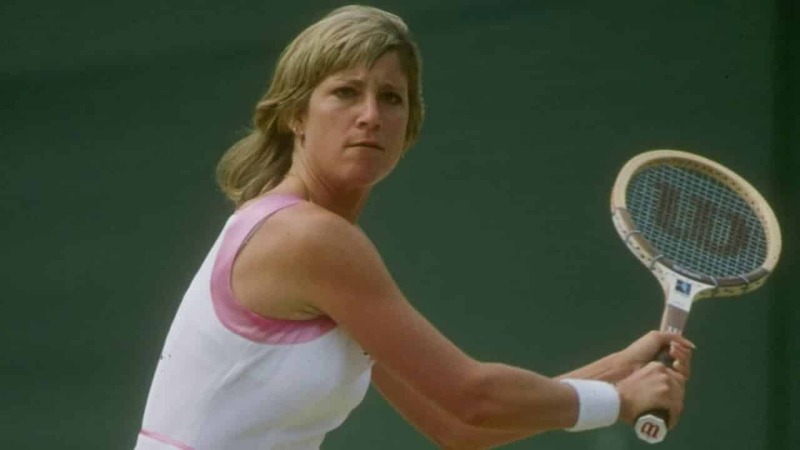 The lady whose graceful postered form plastered the bedroom walls of many a teenage boy back in the 1970s, Chris Evert is a former World Number 1 tennis player. From the US, she won an incredible eighteen Grand Slam singles championships. She holds a number of records, too – six wins at the US Open and a Magnificent Seven at the French Open. She was the world number one in at least five years (75 — 77, 80-81) and according to some people she should have that title for 74 and 78 in to the bargain. As such, she makes number 97 on our list of the 100 Greatest Sports Stars – Ever! Young Christine Marie (later to be called Chris) was born on December 21 1954 and comes from notable tennis lineage. Her father was Jimmy Evert who by the time Chris was born was a professional tennis coach but who had won the Men’s Singles at the Canadian Championships in 1947. It was inevitable that Chris would choose tennis, then – drag racing was hardly going to be an option in the Evert family home! In 1971 she made her Grand Slam tournament debut at the ripe old age of 16 – after she had won the national sixteen-and-under tournament. It was a walk in the park at first – straight sets over Edda Buding. However, she then had a much harder task against the more experienced Mary Ann Eisel and Leslie Hunt. However, she lost out to the then indestructible Billie Jean King. This meant an end to a fantastic 46 match winning streak but she was playing with the big girls now. 1974 was a good year when she won her first Grand Slam singles title (beating her previous winning streak with a remarkable 56 matches unbeaten. 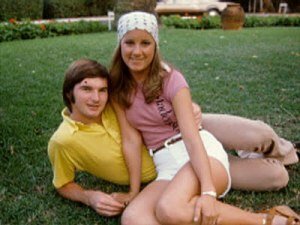 As much focus was placed at the time on her relationship with fellow tennis professional Jimmy Connor as her victory – although this particular love match would prove to be a short live one. She played with him in the mixed doubles finals that year but as her career progressed Evert spent more time concentrating on her singles career. 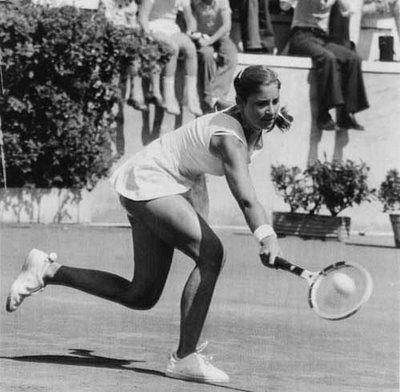 Evert dominated the women’s game for the next five years, defeating the likes of Evonne Goolagong enough times to secure her place in the annals of tennis as the best female player of that era. She was a very cool player – receiving an ice maiden reputation, but then someone came along who would challenge her composure. Although good friends off the court it was Martina Navratilova who would prove to be Evert’s on court nemesis. 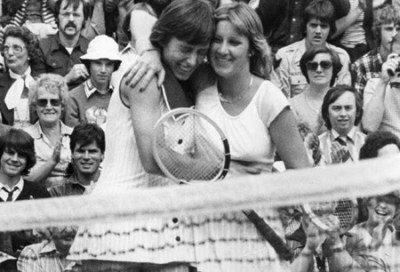 Their rivalry on the tennis court would become the stuff of sporting legend and while Evert bested Navratilova (seen together left) during their early encounters. 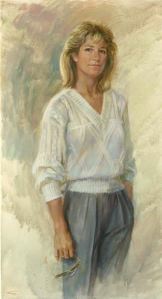 Navratilova would ultimately prove the superior player in the 1980s. Evert was a great player on all surfaces but it was on clay where she was most at home. From August 1973 she won an unbeaten 125 consecutive matches on clay – and only lost seven sets. This remains to this day a record. Incidentally, this streak was broken by Tracey Austin at the Italian Open in 79. She then went on to win a further 72 matches on clay before Hana Mandlikova beat her in the 81 French Open. In one of their all-time greatest barn-burners, Chris & Martina went to 7-6 in the 3rd set in the ’87 Houston final. 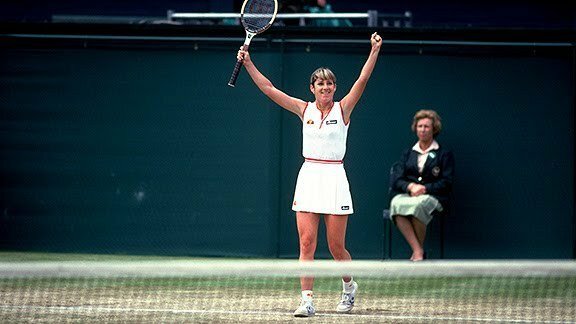 Chris Evert retired from professional tennis in 1989. After all, 157 singles titles were not a bad amount on which to leave – neither were her eight doubles titles. Even her semi-finals history is staggering – out of the 303 tournaments she entered she got through to the semis in no less than 273 of them. All in all, Evert won at a minimum of one Grand Slam singles title each year for thirteen consecutive years. What is Chris Evert doing now? She is currently operating a tennis academy (which bears her name) in the town of Boca Raton in Florida. She also contributes to Tennis magazine. A tennis legend, she will continue to be one of the role models that young players look up to for many decades to come.